The season of Autumn is here and you can feel the shift in the air. Autumn is a romantic time for many. Brisk nights and falling leaves bring thoughts of Fall Romance and cuddling under blankets. For many it is a calming, melancholy time after the heat of the summer. The leaves are turning to warm autumn colors of red, gold, bronze and bursting forth with beauty. They flutter to the ground and rustle beneath your feet, a perfect time for a slow walk hand in hand. There is a snap in the air and a richness to the earth. The first day of fall is also known as the Autumn Equinox or Mabon. It is the time when night and day stand equal in duration; thus is it a time to express gratitude, complete projects and honor a moment of balance. It is known as the second harvest in many traditions. It honors the changing of the season and gives thanks for the abundance of the harvest. It reminds us that we reap what we sow. Be it in a field, friendship or a romantic relationship. Autumn is a time to count your blessings. Remember, an attitude of gratefulness helps bring more abundance our way — what are things you’re glad you have in your life? Maybe write them down on a piece of paper. This also helps in a relationship, too often we are thinking of what we don’t care for and that draws in more negative. This may be a good time while light and dark are equal to reflect on all the good things and share them. The Autumn Equinox is rich and poignant, decorate with colors of fall. Bring in small bundles of herbs and plants. Use apples, gourds, pumpkins and nuts. 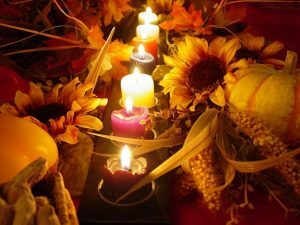 Red and yellow candles may be lit to deepen the atmosphere and ourselves into a place of gratitude. And let’s not forget that cup of hot mulled cider to honor the spirits of the land. abundance, autumn, equinox, fall, gratitude, Mabon, romance. Bookmark.